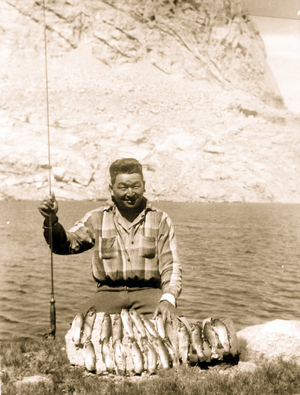 Manzanar internee Tadao Kobata fishing at the Williamson Basin behind Mt. Williamson, part of the Sierra Nevada mountain range in Inyo County. “The Manzanar Fishing Club,” a documentary feature about freedom and the human spirit, starts an exclusive Los Angeles engagement on Friday, March 30, at the Laemmle Monica 4, 1332 2nd St., Santa Monica. A rousing and quirky film that tells the story of the World War II Japanese American Internment through the eyes of internees who all shared a love of fishing, “The Manzanar Fishing Club” relates their experiences, set against the larger story of the community’s imprisonment and persecution during the war. Seventy years after the stealth fishermen at the Manzanar camp in eastern California first slipped past the armed guards, barbed wire and searchlights to fish for trout in the surrounding waters of the Sierra Nevada, their story is finally reaching the big screen. More than six years in the making, the film is based on nearly 70 hours of interviews with 26 surviving internees or their descendants, two MPs, two rangers from the Manzanar National Historic Site, the preeminent Department of Fish and Game authority on the Eastern Sierra fishery, and Dr. Arthur Hansen, one of the leading historians on the Japanese American Internment. Showtimes are 1, 3:10, 5:20, 7:30 and 9:40 p.m. Advance ticket sales are available on the Laemmle Theatres website, and group sales inquiries can be directed to (310) 292-3600. Looking ahead, the filmmakers plan to roll the film out gradually in other cities based on reviews and word-of-mouth. “The Manzanar Fishing Club” was made with support from the California State Library’s CCLPEP (California Civil Liberties Public Education Program) and the National Park Service’s JACS (Japanese American Confinement Sites) grant programs and private donations. A From Barbed Wire to Barbed Hooks LLC production, “The Manzanar Fishing Club” was produced by Shiozaki, Imamura, Lester Chung and John Gengl. The executive producer is Alan Sutton.